With over 10 variants of blackjack from a multitude of leading software developers, Leo Vegas is the perfect secure online casino for 21 players.Leo Vegas is known for its mobile design, but the site offers an array of blackjack titles for all devices, including smartphones, tablets, laptops, and desktops, with the latter two offering more variety. Note: Australian players are no longer accepted at Leo Vegas. The information in this review is intended for an international audience only. When new blackjack players sign up at www.LeoVegas.com you not only get access to a variety of 21 games, but also to a welcome bonus that includes multiple matched deposit bonuses and free spins to use on selected slot games. It is important to note there are wagering requirements applied with the bonus cash, which we detail at the bottom of this page. As mentioned above, there are many different blackjack titles available on the desktop version of Leo Vegas, many with varying table limits to suit all blackjack players. Once you have opened an account, simply click on any title to get started, ensuring you’ve made a deposit first to play with real money. Additionally, you can click on the help or question mark icon in any game to learn the rules and what basic strategy you need to look up to lower the house edge significantly. BetSoft’s titles actually includes the basic blackjack strategy in their help window, so you don’t need to go searching. Leo Vegas also offers an extensive live dealer catalogue powered by several leading software developers, which includes two of the leading blackjack titles from Evolution Gaming. 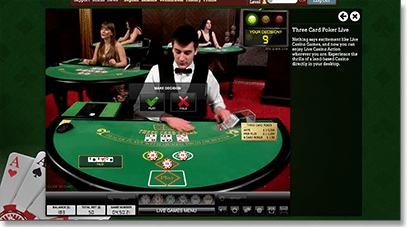 The dealer/s are streamed directly to your screen and you simply place the bets by clicking (or tapping if you are on mobile device) the screen. Live Dealer Blackjack – table limits range from a minimum of $5 and go right up to $5000 for the standard live dealer blackjack variant. You can view how many seats are available in the live dealer lobby. Live Blackjack Party – two dealers streamed directly to your screen with a minimum of $0.25 and maximum of $100. There is just one table, but there are up to 500 open positions as you can ‘Bet Behind’ (bet on the hands of players who are seated at the table). 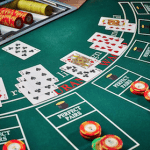 Additionally, there are also live dealer blackjack titles available to play on your Apple, Android, Windows or other smartphone or tablet, and a downloadable app available. Leo Vegas also offer a wide selection of other casino games, including classic fruit machines, 3D video slots, progressives, roulette, baccarat, craps, and poker, as well as the associated variants both standard and unique. You can access the full catalogue via your browser – Safari, Chrome, Firefox, etc., are all compatible – on your desktop or laptop by clicking on our links. You can also view the mobile optimised titles via your smartphone or tablet’s mobile browser the same way. The layout is easy to navigate on both platforms and each category is displayed clearly so you can get playing games fast. 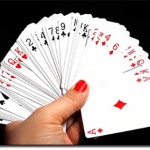 Does blackjack clear bonus wagering requirements? As we mentioned above, there is a generous welcome bonus at Leo Vegas, but you do need to clear the wagering requirements before you can release it as cash, as well as withdraw winnings. The welcome bonus needs to be wagered 35 times before winnings can be withdrawn. This sounds like a lot but if you win you can just play through your winnings and potentially continue to win until you have cleared the turnover requirements and withdraw anything leftover – but only if you think it is worth it. However, all casino games contribute a different percentage to the wagering requirements. While slots are the best at 100%, they have a high house edge so you are less likely to win. Table games, including blackjack, at Leo Vegas only contribute 10% to the wagering requirements. But if you opt for NetEnt’s Classic Blackjack title and play the perfect basic strategy you can get the house edge as low as 0.13% and potentially win enough to clear the bonus. Ultimately, the bonus amount is probably better spent having a flutter on the pokies, while your cash balance is a better alternative when playing blackjack.